Thank you for visiting the Tribal Nations & the United States: An Introduction page. We are proud to announce an updated version of the report will be release in March 2019. Please check back here for the newest edition of the report in the coming weeks. 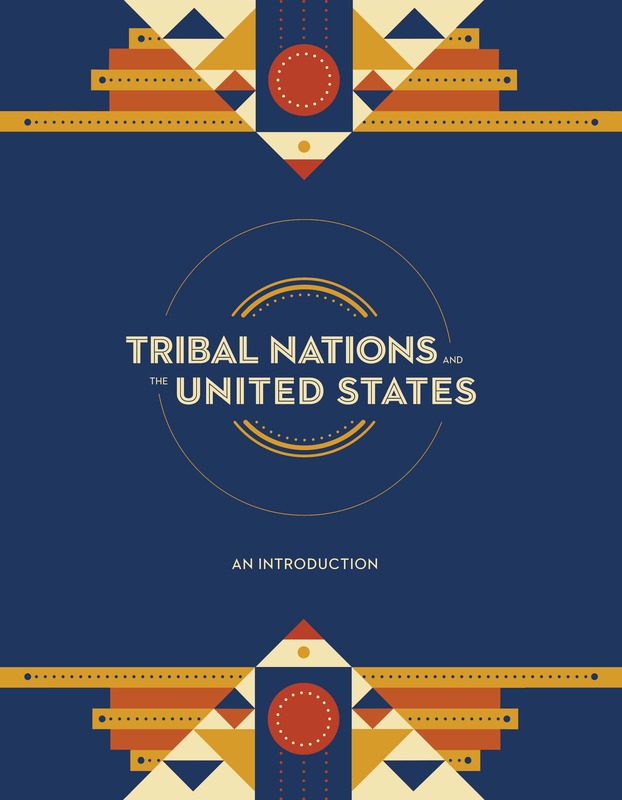 The guide "Tribal Nations and the United States: An Introduction" developed by the National Congress of American Indians seeks to provide a basic overview of the history and underlying principles of tribal governance. The guide also provides introductory information about tribal governments and American Indian and Alaska Native people today. The purpose of the guide is to ensure that policy decision makers at the local, state, and federal level understand their relationship to tribal governments as part of the American family of governments. 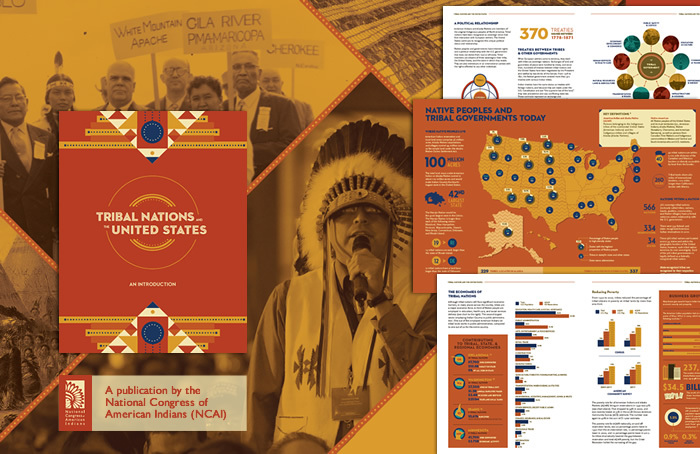 Additionally, this guide provides the information necessary for members of the public at large to understand and engage effectively with contemporary Indian Nations. There are 573 federally recognized Indian Nations (variously called tribes, nations, bands, pueblos, communities and native villages) in the United States. Approximately 229 of these ethnically, culturally and linguistically diverse nations are located in Alaska; the other federally recognized tribes are located in 35 other states. Additionally, there are state recognized tribes located throughout the United States recognized by their respective state governments. American Indians and Alaska Natives are members of the original Indigenous peoples of North America. Tribal nations have been recognized as sovereign since their first interaction with European settlers. The United States continues to recognize this unique political status and relationship. Native peoples and governments have inherent rights and a political relationship with the U.S. government that does not derive from race or ethnicity. Tribal members are citizens of three sovereigns: their tribe, the United States, and the state in which they reside. They are also individuals in an international context with the rights afforded to any other individual. The governmental status of tribal nations is at the heart of nearly every issue that touches Indian Country. Self-government is essential if tribal communities are to continue to protect their unique cultures and identities. Tribes have the inherent power to govern all matters involving their members, as well as a range of issues in Indian Country. The essence of tribal sovereignty is the ability to govern and to protect and enhance the health, safety, and welfare of tribal citizens within tribal territory. Tribal governments maintain the power to determine their own governance structures and enforce laws through police departments and tribal courts. The governments exercise these inherent rights through the development of their distinct forms of government, determining citizenship; establishing civil and criminal laws for their nations; taxing, licensing, regulating, and maintaining and exercising the power to exclude wrongdoers from tribal lands. In addition, tribal governments are responsible for a broad range of governmental activities on tribal lands, including education, law enforcement, judicial systems, health care, environmental protection, natural resource management, and the development and maintenance of basic infrastructure such as housing, roads, bridges, sewers, public buildings, telecommunications, broadband and electrical services, and solid waste treatment and disposal.